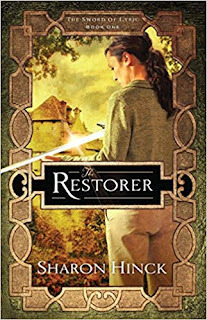 A friend and critique partner recommended The Restorer by Sharon Hinck, first book in The Sword of Lyric series, to me several years ago. I read the first few pages, thought it wasn't for me, and didn't touch it again for three years. Last week, I decided to give it another try--after all, Susan Donetti's other recommendations have all been hits. I picked up where I left off, and within five minutes I was hooked! The Restorer is a bit different than most of the books we review here; it's about a tired, 40-ish, soccer mom, and there's no young couple romance, only romance rekindled within long-time marriages. But different can be good, and this was definitely a good book. Susan Mitchell thinks she's an ordinary soccer mom, tired, and she wants God to use her in some way--possibly as a counselor at a drug rehab center. But then she's sucked into another world and finds herself possessed of a sword, remarkable hearing and sight, and miraculous self-healing abilities. And about that latter ability, certain people think there's no better way of proving that one than by slicing her with a knife and watching her heal. It'd be annoying to Susan if it weren't so frightening, for that ability marks her as the Restorer, the person (usually a warrior Guardian) the One sends to help his people when they're in trouble. That wasn't the way of being useful she had anticipated. Not only must she adapt to a foreign culture (with a strange mix of technology and simplicity), deal with "guests" who poison minds, tackle corrupt rulers, and lead people back to the Verses, she has to learn how to fight. And find her way home. Because she ends up dead like the last Restorer. Despite me not being a soccer mom, I related very well to Susan and loved many of the secondary characters as well, especially Mark (her husband, who was a shocking secret), Tristan, and Keiran. The settings and the different cultures within the collection of tribes making up the nation Susan is sent to save are very interesting and well-drawn. Susan's story is in some ways parallel to the story of Deborah in Judges, and I enjoyed that connection and the spiritual aspect of the story. Have you read The Restorer? Do you like books about married couples or stick with books about young singles? I started this book and really enjoyed it, but I keep getting distracted by other books I need to review or endorse. Hopefully I'll have a chance to finish it soon! Sharon Hinck lives near me and also was at Realm Makers - she's such an amazing lady! It's really cool that she lives near you! Sounds like you'll be like me and start and end at two widely different times! I hope you get to finish it soon. I haven't read it, but have heard good things about the author and her stories. Sounds like a good with a fresh perspective. Thanks for sharing, Lizzie!